FLUSHING, N.Y. -- Saturday at golf’s Masters Tournament is traditionally known as "Moving Day," the day where players aim for low scores to position themselves for the final round on Sunday. At the USTA/ITA National Indoor Intercollegiate Championships at the USTA Billie Jean King National Tennis Center, moving day occurred on Friday, as the tournament format required Thursday’s first-round winners to play two matches to reach the semifinals on Saturday. In some cases, players had little more than an hour in between their second-round and quarterfinal matches, and by any measure, those players who survived had most definitely earned their way into Saturday’s semifinals. In a continuation from Thursday, which saw four men’s seeds lose, including the top two, Friday’s action saw more upsets almost immediately, as reigning NCAA champion and No. 4 seed Bradley Klahn of Stanford was steamrolled by Florida senior Alexandre Lacroix, 6-2, 6-2, in the second round. Lacroix, who won the Land Rover Napa Valley Tennis Classic in September, displayed incredible speed and court awareness and never allowed Klahn to gain entry into the match. In the afternoon’s quarterfinal, Lacroix continued his strong play, defeating Texas Tech junior Gonzalo Escobar, 6-3, 6-3. Escobar reached the quarterfinals via another upset, topping No. 8 Chase Buchanan of Ohio State 6-3, 6-4. Buchanan, the 2009 USTA Boys’ 18s National Champion, played well but was rendered helpless, as Escobar recorded almost no unforced errors in the match. In Saturday’s semifinals, Lacroix will face a fellow member of the SEC in Tennessee sophomore Rhyne Williams. Williams continued his strong play on Friday, after knocking off top-seeded Alexander Domijan on Thursday, overpowering Duke senior Reid Carleton, 6-1, 6-3, in the second round behind a forehand that seemingly went in, no matter where Williams tried to place it. Williams had a tougher match against Sacramento State senior Kiryl Harbatsiuk but ultimately prevailed, 6-4, 2-6, 6-3. The matchup between Lacroix and Williams will be a rematch from last month’s ITA/D’Novo All-American, a hotly contested match between two of the more vocal and volatile players in college tennis that was won by Lacroix, 3-6, 7-6 (3), 7-6 (7). The bottom half of the men’s draw features the only remaining seeded player, No. 7 seed and defending NIIC champion Steve Johnson of USC. Johnson utterly dominated University of Denver sophomore Enej Bonin, 6-0, 6-1, in the second round but found himself in a tight battle with Louisville senior Austen Childs for a place in the semis. Childs pulled off the third major upset of the second round, losing the first set to No. 3 seed Henrique Cunha of Duke before rebounding to win, 3-6, 6-2, 6-4. After a tough three-set victory, Childs was hoping for an easier quarterfinal match against Johnson and looked to be in control after winning the first set in a tiebreak. But Johnson ultimately found his forehand stroke and cruised in the latter two sets, winning 6-7, 6-2, 6-4. In order to successfully defend his title, Johnson will have to get past Ohio State freshman Blaz Rola. Rola, whose only loss in his short OSU career came at the All-American, had little trouble in his second round match against Pepperdine sophomore Sebastian Fanselow, displaying a punishing serve en route to a 6-3, 6-2 victory. Rola was then forced to wait to play his quarterfinal match, as his potential opponents were engaging in the longest and most entertaining match of the day. Watching Big 12 rivals Austin Krajicek of Texas A&M and John Peers of Baylor reminded tennis fans of days of yore, as each player employed a serve-and-volley strategy throughout the match, resulting in quick points but long games and few breaks of serve. After close to three hours, Krajicek, the 2008 USTA Boys’ National Champion, prevailed 7-6 (3), 5-7, 7-6 (6), but the match had definitely taken its toll. With little more than an hour to rest, Krajicek fought admirably but was unable to move well enough to deal with the bigger Rola, and the Ohio State player advanced by a 6-4, 7-6 (1), score. In stark contrast to the men’s draw, the women’s draw featured almost no upsets on Thursday, and that trend continued in Friday’s second round, as just one seed failed to advance in the form of No. 3 Kristy Frilling of Notre Dame. One of the hardest hitters in the event, Frilling was frustrated by Texas sophomore Aeriel Ellis, who returned almost every ball and forced Frilling into numerous unforced errors en route to a 7-5, 6-1 victory. Ellis kept her momentum going in the quarterfinals, defeating Stanford freshman Kristie Ahn, despite losing the first set, 3-6, 6-4, 7-5. Ahn, the 2008 US Open qualifier and New Jersey native, reached the quarters via a 6-2, 6-2 win over Baylor junior Sona Novakova but played a number of loose points against Ellis and was unable to hold her serve in the final set. Ahn’s fate was shared by both of her Stanford teammates – Hilary Barte and Nicole Gibbs – on Friday. Barte, the tournament’s top seed and reigning ITA/Riviera All-American champion, struggled throughout the day, losing the first set to Cal-Berkeley’s Mari Andersson in the second round before coming back to win in a match that was even closer than the 4-6, 6-4, 6-2 score indicated. Barte again lost the first set in the quarterfinals to No. 6 Allie Will of Florida but was unable to muster a similar comeback, losing 6-4, 6-3. Gibbs, meanwhile, looked in control of her second-round match against No. 5 Denise Dy of Washington, taking the first set, 6-3. Despite losing the second set in a tiebreak, Gibbs marched out to a 4-1 lead in the third but was unable put away the Husky senior, as Dy stormed back to take the match 3-6, 7-6 (4), 7-5. 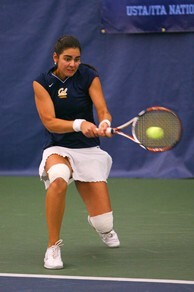 With the victory, Dy set up a quarterfinal showdown against Pac-10 rival Jana Juricova of Cal-Berkeley, the No. 2 seed and defending NIIC champion. Juricova reached the quarterfinals via an easy 6-2, 6-1, victory over Florida freshman Alex Cercone, and the Cal junior showed the same dominant form that allowed her to win the title last year, as she defeated Dy by the same 6-2, 6-1 score. While Juricova will face Ellis for a spot in her second consecutive NIIC final, Will will face USC senior and No. 7 seed Maria Sanchez. Sanchez won her second-round match against Clemson junior Josipa Bek, 7-6 (5), 6-2, and then faced Michigan senior and No. 4 seed Denise Muresan for the spot in the semifinals. Muresan advanced to the quarters after one of the highlight matches of the day against Penn freshman Connie Hsu. In a match that epitomized back-and-forth momentum swings, Muresan lost the first set, 6-3, but won the second set by the same score. Despite seizing the momentum, Muresan then fell behind 5-1 in the third set before storming back to tie the score at five. Muresan and Hsu battled into a tiebreak, where the senior’s experience won out, and Muresan advanced by a 3-6, 6-3, 7-6 (5) score. However, the second-round match clearly sapped Muresan of her energy, and she put up little fight against the big-serving Sanchez, who won fairly easily 6-2, 6-2. Saturday’s semifinals, which will feature five members of the 2010 USTA Summer Collegiate Team, might seem like a walk in the park to the participants after such a grueling Friday. However, the tension continues to rise with each passing round, and all eight players know what’s at stake: the chance to be crowned champion at the premiere event on the fall tennis calendar. For live scoring and complete men’s and women’s singles and doubles draws, click here.